Birthplace of Chilean poetess Gabriela Mistral, site of astronomical observatories, and producer of the best Pisco – a typical brandy-like drink – these are some of the characteristics of the Elqui Valley . A trip up the valley reveals some of its many contrasting features: blue skies, pure air, immense green vineyards and plantations of papayas among high, arid mountains. This is a place not to be missed if you are holidaying in La Serena or in search of tranquillity. The Elqui Valley offers peace, rest, interest and an irresistible attraction to visit all its villages – with their churches, vines, squares, adobe houses, handicrafts and local customs. An ideal getaway from the bustle of the city, where all you hear when you go out walking is the breath of the wind in the trees. It is also well known for its magnetic vibrations, drawing many visitors to the valley just to practice yoga, relax and meditate, living a natural life and taking advantage of the almost perceptible energy as they go about their daily tasks. The clear skies attract more travellers every day, coming to visit the Tololo and Mamalluca observatories (it is essential to call ahead and reserve). Another important attraction is the sunny climate which warms the fertile soil, the steep mountainsides and rushing rivers. There is no single route to take when exploring this beautiful valley, every visitor can choose that which he finds of most interest. Here are a few suggestions. Discover the Puclaro dam, Vicuña, Villaseca, Monte Grande and Pisco Elqui, where you can visit cultural museums, pisco factories, centres of alternative medicine and meditation, go horse-riding, practice water sports, and even buy papayas in their various different forms: crystallised, as juice or jam, and preserved in syrup. This is a typical Elqui Valley village surrounded by fruit orchards and gardens. It lies 15 kms up the valley from La Serena and its attractions include one of the oldest cemeteries in and a beautiful adobe-built church. The inhabitants of the village have specialised in the production of the exquisite sweets and preserves which are on sale. This is an old village with an adobe church dating from 1892. It lies 23 kms from La Serena and the main feature of the surrounding countryside are the many aromatic fruit trees. This is one of the privileged places for observing the skies of the Elqui Valley , being at 450 m. above sea level and with an observation site. It lies 27 kms from La Serena, just beyond the hamlet of the same name. This picturesque village is 34 kms from La Serena and is considered the cradle of the pre-Hispanic culture of the same name. A striking feature are the big old farm houses where you can eat typical dishes, especially sweets of made fig and papaya, as well as quince, manjar (a soft toffee-like preparation) and home-made bread. Pay a visit to the Casa de la Cultura and the meditation rug workshop, and practice meditation with a Tibetan monk. This impressive work of engineering covers 760 hectares and is located 41 kms from La Serena. It is not only set in a delightful natural setting, but also offers the chance to practice windsurfing or go for walks in authorised areas. Shortly before reaching Vicuña you will come to El Tambo, a little village surrounded by mountains and vineyards. The narrow streets converge on the square where there is an adobe church with bells cast in gold. The locals offer papaya fruit and products at the roadside. Vicuña, perched on the banks of the Elqui River , is the largest urban centre of the Valley and the start of the Pisco route. It offers hotels and excellent restaurants, and the inhabitants sell handicrafts and papaya products, both very typical of the area. The town is profoundly linked to the life of Gabriela Mistral, and a visit to the Gabriela Mistral Museum is recommended, where are preserved the archives, library, pictures, prizes and personal effects of this Chilean poetess, awarded the Nobel Prize in 1945. The house where she was born is also worth visiting, containing furniture, photographs and mementoes of her life. Both these places sell souvenirs, and different editions of the writer’s works. Another 9 kms up the valley is the Observatorio Comunal Cerro Mamalluca which is open to the public for guided tours during the day, and every night of the year to amateur astronomers, offering the chance to observe the night skies through a 30 cm diameter telescope mounted in a dome. Reservations should be made in Calle Gabriela Mistral 260, office 1 in Vicuña, or by telephone: (56) (51) 411352. It is impossible to miss the huge vineyards planted in this sector of the valley. There is any number of brightly coloured signs inviting the traveller to try the flavours of the pisco produced from this fruit. A few kilometres past Vicuña is the start of the Pisco Route. The cradle of the manufacture of this typical spirit is in the heart of the Elqui Valley , where pisco production ranges from primitive home distilling to the most modern technology. The marks include Capel, 3R, Artesanos del Cochiguaz and Los Nichos, to name but a few. This is a small village set among arid mountains, 8 kms from Vicuña. It is known for the local producers who use solar ovens. We recommend a visit to Señora Lucila Rojas, one of the initiators of the practice, who explains all the characteristics of this singular apparatus. This village, lying further up the Valley, is one of the more important in the area because it conserves its characteristic structure grouped around a main street. It is very picturesque, with its fine adobe church, and it is surrounded by acres of vineyards. Entering the village, on the banks of the Elqui river, is the Cooperativa Agrícola Pisquera de Elqui Capel, where you can take a guided tour of the plant and see the process by which pisco is produced, try the product and buy souvenirs. This is a very traditional village on the road to Monte Grande, 9 kms from Vicuña. It has a beautiful square, an ancient church dating from 1867 and the recreation of a home from the Diaguitas Indian culture. The local people sell typical products of the Valley and replica ceramics of Diaguitas handicrafts. This village stands at the confluence of the rivers Elqui, Turbio and Claro, making it one of the Valley’s beauty spots. Here is also a parting of the ways: one road takes the Pisco Route to Pisco Elqui, while the other continues up to the border crossing into at Agua Negra. Located 9 kms beyond Rivadavia, this is a typical village with narrow streets overhung by ancient pimiento trees, offering a view up the Valley of the Claro river, the foothills all covered with bright green vineyards. 31 kms from Vicuña, this historic village consists of a main street where the visitor may find both its cultural attractions and its tourist services, such as restaurants and handicraft shops. There is a beautiful church with a tall wooden bell-tower. In her childhood, Gabriela Mistral lived in the Schoolhouse and Post Office. There she learnt her first lessons with her elder sister, who was both teacher and post-mistress. Gabriela Mistral’s Mausoleum stands on a rocky promontory affording a wide view over the valley. Another attraction of the village is the Zen Art Galley, of Buddhist origin, which has a display of paintings and also offers relaxation and meditation services. Near the handsome square is the Artesanos del Cochiguaz mill, an artisanal pisco factory which offers tourist guided tours of the installations and a shop where you can buy its products and other souvenirs. Only ten workers in this factory produce more than one million litres of the much sought-after spirit. There is also a museum containing old machinery used in times gone by in the production of alcohol. 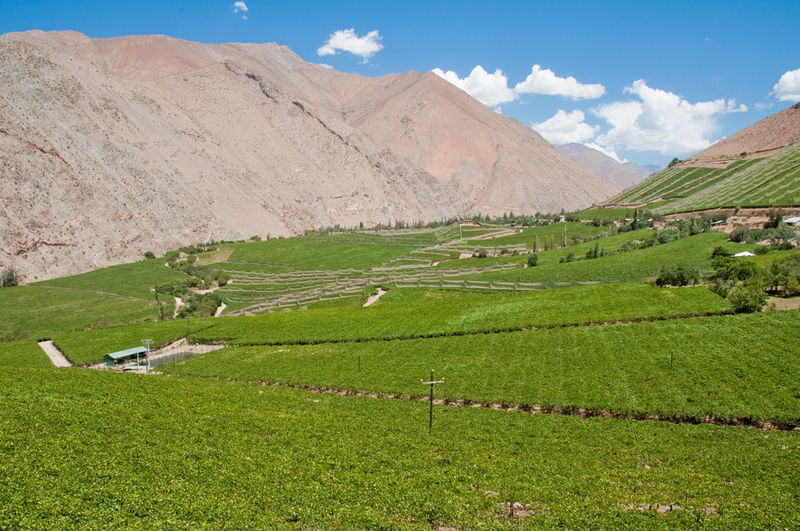 The town of Pisco Elqui is perched on a low hill, contains good hotels and restaurants. One of its principal attractions is the 3R pisco factory, where you can take a guided tour of the distillery and installations. It belonged to one of the first producers in this zone, Rigoberto Rodríguez Rodríguez, and was later bought by Pisco Control. Located 4 kms along the road to Alcohuaz, one of its main attractions is a cellar used for storing and aging the product, and which was the scene of wild parties which the owner threw for his friends, as the marks on the walls and paintings bear witness. On the outskirts of Pisco Elqui is the oldest pisco plant in the valley, better known as Los Nichos.